Following the most vibrant car market on the planet. By someone who lives there. In the last few years, Beijing became more famous for its thick smog than for the Imperial Palace. Not wanting to be embarrassed during the Olympics, and after a lot of head-scratching, the City of Beijing had resorted to what insiders called the “Nigeria Solution:” Cars with license plates ending in an odd number were allowed to drive on odd days, cars with even numbers on even days of the month. In the 70’s, the same had been tried in Lagos, Nigeria. The city of 7 million suffocated in gridlock. Lagos instated the odd/even rule. A friend of mine, who was sent to Lagos by Volkswagen to help launch their new plant in Nigeria, called the rule “the best marketing campaign we ever had – and it was free.” People who had the money simply bought a second car and kept on driving. Cars with a license plate ending in 1 or 6 are not allowed to drive on Mondays. Cars with a license plate ending in 2 or 7 are not allowed to drive on Tuesdays. Cars with a license plate ending in 3 or 8 are not allowed to drive on Wednesdays. Cars with a license plate ending in 4 or 9 are not allowed to drive on Thursdays. Cars with a license plate ending in 5 or 0 are not allowed to drive on Fridays. Cars with temporary plates, or with plates ending with a letter, are treated as “0” cars: No driving on Fridays. Police, ambulances, fire trucks, busses, taxis and other public transport vehicles are exempt. On Saturday and Sunday, everybody may drive. The rule applies only within the 5th Ring Road. The rule applies to privately owned vehicles from 6am to 9pm. For company-owned or government-owned vehicles (except for the ones mentioned above) the rule applies around the clock. How the authorities will notice whether a car is privately or company owned is anybody’s guess. My car is owned by my company. But they would have to pull me over and check my registration to find that out. Or will they follow motorists at night, call in their plate, and pull them over if it's a Friday, if the plate ends in a 5, and if the vehicle is registered with a company? They might just do that in Germany. But TIC: This Is China. It gets even more complex: Each month, the deck will be reshuffled, and new days will be announced that are off-limits for certain numbers. By end of October, a Beijinger with a 1 as the last number on his plate has hopefully gotten it in his head that on Mondays, he has to take the subway or hitch a ride with his neighbor. Come November, he will have to unlearn everything. In November, it could be a Wednesday. And it could be a Tuesday in December. Or a Friday. Nobody knows. The traffic bureau will announce the new days a week before the start of a new month. It is no surprise that Beijing is a bit overwhelmed by the scheme. One would think that the Chinese are more attuned to numbers. Numerology is big in China. Vanity telephone numbers are unknown in China, because Chinese supposedly remember numbers better than letters. But even to the numerically superior Chinese, the scheme appears to be a bit too much. On Monday, I saw many cars with 1 or 6. On Tuesday, I saw a lot with 2 or 7. On Wednesday, many cars with 3 or 8 were on the road. They weren’t just on the road, they were on broadcast television. Footage of scofflaws who ignored the new rules ruled the airwaves. Nevertheless, I had to tell my driver that he would not be allowed to pick me up at the airport on Thursday, because of the number 4 on our plate. He never had heard of the rule, and he looked at me as if I'm a "250" - that's what the numerically superior Chinese call a daft person. Beijing’s car dealers have new hopes that people will find an incentive to own a second car once the rules sink in. But what happens to the poor folks who have the bad luck of owning one car that has a 1 as the last number of the license plate, while their second car has – dammit – a 6? Now you really need a second car. Many had acquired a second car before the Olympics and had made sure that the plate ended in an odd number if the first car’s number was even. And now the investment is supposed to be for naught? The Traffic Bureau has mercy with these poor souls. They can go and trade in their license plate for an non-conflicting number. And with two cars, they can happily drive on all days of the week. According to just released figures, 2 million more cars are expected to take to Beijing’s roads by 2012, bringing the total to 5.4 million. If the numbers-scheme stays in place, we could see 2 million more new cars by next year. 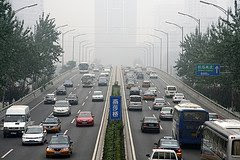 Shanghai will adopt a watered-down version of the capital's traffic restrictions, Gasgoo says. Starting in November, vehicles belonging to the government or state-owned enterprises will be banned from the roads on one out of five weekdays in a system based on license plate numbers. Privately owned cars will be unencumbered. Picture by ernop. Thank you! In common usage, horoscope often refers to an astrologer's interpretation, usually through a system of Sun sign astrology or based on calendar significance of an event, as in Chinese astrology. Bertel Schmitt conceived of Sinamotive after a 32 year career in advertising and marketing. He ran and owned advertising agencies in Duesseldorf, Germany, and New York City. During approximately 30 years of this career, Volkswagen A.G. was Bertel’s most important corporate account. Schmitt’s advertising and marketing career touched many corners of the industry with a special focus on automotive products and services. Since 2004, he lives in Beijing China with his wife Tomoko. Bertel Schmitt is a founding board member of the Offshore Super Series, an American offshore powerboat racing organization. He is co-owner of the racing team Typhoon. Bertel also is Man-in-China for TheTruthAboutCars.com an irreverent and much-read U.S. portal for car reviews, auto news, editorials and podcasts. The Great Deformation: Why Income Inequality Has Become Intractable - Recent work on iinequality by Lance Taylor says this will be a particularly hard problem to solve.